On admission, the beaver was quiet but alert and weighed 21.9 kg [about 48 pounds]. The veterinary team found multiple wounds on the beaver’s back and tail; the wounds looked necrotic and inflamed. Radiographs were within normal limits. The team was not able to find a definitive cause of the beaver’s depressed attitude, though possible causes included sepsis from infected wounds, organ failure, or neurologic disease. The beaver’s wounds were cleaned and debrided, and medical honey and bandages were applied to the wounds to promote healing. The beaver was also given fluids and vitamins and was placed in the Center’s Bear Pens. During the following two weeks, the beaver’s wounds began to heal. While the veterinary team noted that the beaver appeared a little brighter and more alert on some days, its attitude was still abnormal and the beaver had difficulty ambulating around the enclosure. In early April, the beaver made more consistent improvements, including classic defensive beaver behavior, including tail slapping to warn others away. Dr. Karra, the Center’s veterinary intern, is encouraged by the beaver’s progress and hopes that it will be able to be released later this month, once the wounds are fully healed. 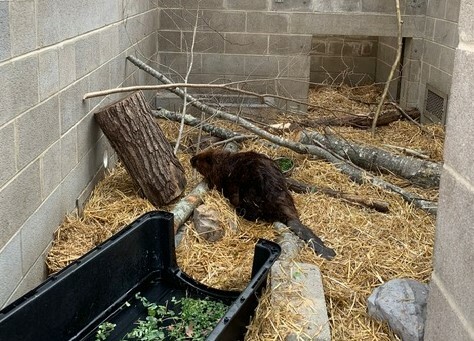 In the meantime, the beaver appears to be settling into its makeshift beaver habitat, complete with two water pools, large logs, and fresh browse. Dr. Karra has been carefully restocking logs each day -- the beaver particularly likes stripping the bark off of large logs! Your donation will help provide veterinary medical care to this injured beaver. Thanks for your help! Wildlife rehabilitator Kelsey coordinated release plans with the Department of Game & Inland Fisheries; in general, animals need to be released either within the county in which they were rehabilitated or back at their initial rescue location. Beavers present some additional release challenges since they have such specific habitat requirements, so Kelsey worked with the permits office to ask permission to release the beaver elsewhere. She was able to coordinate a release location with a USDA biologist who was looking to establish beavers on a piece of property he managed. The beaver was picked up for release on Monday, April 22.